Triplex – 34 Octavia Street, Belleville, On. Calling all investors! 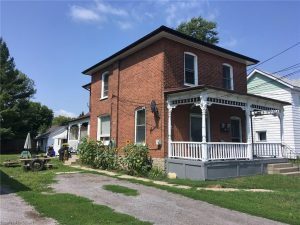 Fully occupied 2 story Brick triplex in the West end of Belleville. Building consists of a 2 bedroom apt upstairs, 1 bedroom and a bachelor apartment on the main level. Garage is also rented out to a fourth Tenant. 3 Hydro meters, two of the Tenants pay their own hydro. Natural gas heat. Hi efficiency furnace new in 2007. Roof re-shingled in 2011. 200 amp service added in 1989 Electrical and plumbing updated at that time. Washer & dryer in main floor 1 bedroom unit. Single driveway on either side of the house with lots of additional parking space. Central location close to downtown, schools and shopping. Revenue equals $33,060 per year. Expenses $11,853 leaving a net operating income of $21,207 for a 7.1% cap rate. All appliances included. Any unwanted items at the back of lot will be removed by Seller prior to the closing. 24-hour notice required for all showings. BRIDGE STREET WEST TO OCTAVIA. HOUSE ON WEST SIDE BETWEEN BRIDGE AND CATHERINE STREET. SIGN ON. All Tenants belongings and all items in the garage. Multi Unit-3 Units. 2 floors.